MONTREAL, QUEBEC–(Marketwired – Jul 15, 2016) – Farnborough International Airshow – Bombardier Commercial Aircraft today congratulated launch operator Swiss International Air Lines (SWISS) on the successful entry-into-service of the CS100 aircraft. The maiden commercial flight of the CS100 aircraft has departed Zurich for Paris Charles de Gaulle. "We salute SWISS on the CS100 aircraft's successful entry-into-service and thank the airline for its outstanding support to the C Series aircraft program," said Fred Cromer, President, Bombardier Commercial Aircraft. "We also congratulate all the employees and suppliers who have worked tirelessly to bring us to this great milestone. It is an outstanding achievement and continues to build the momentum for the C Series aircraft program. "The launch of revenue service with the CS100 aircraft is a fitting culmination to this year's Farnborough Airshow, and follows Bombardier Commercial Aircraft's strong sales performance in the first half of 2016 during which we obtained firm orders for 127 C Series, 19 CRJ and 15 Q400 aircraft -including orders from Porter Airlines and All Nippon Airways each of which ordered an additional three Q400 aircraft as disclosed during the airshow. The capture of these 161 firm orders in six months signals Bombardier's intent to re-assert itself as a strong leader in commercial aviation." As announced during the airshow, Transport Canada has awarded type certification to the CS300 aircraft and the delivery of this larger model to airBaltic is scheduled for the fourth quarter of 2016. To maximize aircraft utilization and minimize maintenance costs, the airline has joined SWISS to become the second customer enrolled in Bombardier's Smart Parts program for the C Series aircraft. The Smart Parts program provides comprehensive component maintenance, repair and overhaul services, access to a strategically located spare parts exchange pool, and on-site inventories based at the airlines' hubs. "During the show, we connected with senior airline and aviation industry executives from around the world and are very encouraged by the feedback we are getting on our new C Series aircraft product positioning that urges airlines to put aside decades-old aircraft design in favour of an all-new, technically-advanced aircraft aimed specifically at the single-aisle, 100- to 150-seat market. We're giving airlines the freedom to match demand with a right-sized aircraft that provides the opportunity to make more profit," added Mr. Cromer. "The C Series aircraft has the state-of-the-art design, materials, technology, performance and passenger amenities, as well as economics that set it well apart from other aircraft in its class." Also at Farnborough, Bombardier said it will soon begin validations of the C Series aircraft's capability to safely conduct steep (5.5 degrees ) approaches to London's close-to-downtown City Airport and land and stop safely on its 4,948-foot (1,508-metre) runway. Using virtual reality technology, Bombardier also presented its new CRJ Series aircraft interior at the airshow. Participants had a preview of the fresh, contemporary cabin design that includes a more open entrance area, spacious lavatory and greater on-board storage capacity. Combined, these new features deliver an enhanced passenger experience and more value for airlines. Bombardier also launched the Q400 Multi-Role aircraft to meet the diverse and demanding needs of customers. The fully certified Q400 Multi-Role aircraft can be tailored for firefighting, cargo transport, passenger transport, disaster relief and medical evacuation. The aircraft is rapidly reconfigurable and systems can be swapped in and out easily to meet operational and network requirements. Bombardier had a highly visible presence in the aircraft static display with a flybe Q400 turboprop, a CRJ1000 regional jet from Air Nostrum, and CS100 flight test vehicle five (FTV5) in SWISS colours. FTV5 also conducted three demonstration flights on July 10 hosting media, C Series aircraft program suppliers and government representatives. SWISS' first delivered CS100 aircraft also appeared at Farnborough and opened the flying display on July 11 when it departed for Zurich to launch revenue service. The C Series is the only aircraft optimized for the 100- to 150-seat market segment, which drives the aircraft's phenomenal economic proposition and performance, opening up new opportunities for single-aisle aircraft operation. Comprised of the CS100 and the larger CS300 aircraft, the C Series family represents the fusion of performance and technology. The result is aircraft that deliver unmatched performance and economics in the 100- to 150-seat market segment and an 18 per cent lower cost per passenger, making them the ideal candidates to complement larger single-aisle aircraft. Airlines can now operate routes that were previously not profitable or even possible. An improvement in range in excess of 20 per cent out of hot-and-high airports such as Denver, Mexico City or Lhasa has been confirmed. Bombardier has created a new standard in cabin design and flexibility to ensure an unrivalled passenger experience. The aircraft's larger seats, overhead bins and windows deliver a widebody feel that offers passengers unparalleled comfort in a single-aisle cabin. The CS100 and the CS300 aircraft have over 99 per cent parts commonality as well as the same pilot type rating. The groundbreaking Pratt & Whitney PurePower® PW1500G engine, combined with the aircraft's advanced aerodynamics, delivers reduced fuel burn, noise, and emissions – making the C Series the most community-friendly aircraft. For more information on the Bombardier's commercial aircraft, visit http://news.commercialaircraft.bombardier.com. Follow @BBD_Aircraft on Twitter to receive the latest updates from Bombardier Commercial Aircraft. Bombardier, C Series, CRJ Series, CRJ1000, CS100, CS300, Q400 and The Evolution of Mobility are trademarks of Bombardier Inc. or its subsidiaries. 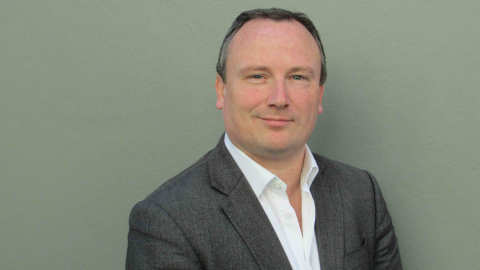 IPG Mediabrands’ Global CEO Henry Tajer has announced the appointment of Leigh Terry as CEO of IPG Mediabrands in Asia Pacific. Terry is a highly regarded media innovator and leader whose career has spanned Europe and the Pacific. Leigh will start his new assignment with IPG Mediabrands at the end of 2016, and will partner with Reg Davidson, who was named chief financial officer of Mediabrands Asia Pacific earlier this year. Davidson is formerly CFO of IPG Mediabrands Australia. 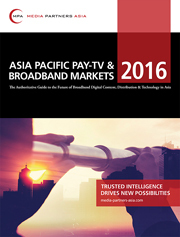 The Asia-Pacific pay-TV industry will grow at a 5.8% average annual rate from 2016 to 2021, according to a new report, Asia Pacific Pay-TV & Broadband Markets, published by leading industry analysts Media Partners Asia (MPA). MPA projects pay-TV industry sales across 18 major markets in Asia Pacific to climb from US$54 billion in 2016 to US$72 billion by 2021, rising thereafter to US$81 billion by 2025. The pace of pay-TV subscriber and revenue growth is slowing however, weakened by an economic slowdown and increasing competition from both legal and illegal alternatives. Pay-TV subscriber growth declined or substantially decelerated in Hong Kong, Indonesia, Malaysia and Singapore in particular. At the same time however, India and Korea remain two of the region’s largest and most scalable pay-TV opportunities. Revenue growth will also accelerate in Australia and the Philippines, largely thanks to subscriber growth. However, MPA analysts have lowered subscriber growth forecasts across much of Southeast Asia, especially for Indonesia, Malaysia and Singapore, although ARPU (average revenue per user) should remain resilient in both Malaysia and Singapore. The pay-TV industry in China, meanwhile, remains the largest in the region and is becoming increasingly digitalized. Pay-TV growth opportunities for broadcasters are limited however, due to increasing regulation as well as competition from free and paid online video services. Elsewhere in the region, subscription-based video-on-demand (SVOD) services have had a negligible impact on pay-TV so far, despite the global launch of Netflix earlier this year, in addition to increasing competition among lower-priced regional and local SVOD services. Most pay-TV subscribers downgrading or canceling pay-TV services are moving to illegal services, and to free, ad-supported options across both TV and online video. At the same time, more pay-TV operators are rolling out connected set-top boxes that can incorporate OTT video services. In addition, some operators (telcos in particular) are aggressively hard-bundling video content, including pay-TV channels, with high-speed broadband. This is helping drive subscriber growth, especially in some Southeast Asian markets. NARUTO SHIPPUDEN: ULTIMATE NINJA BLAZING Distribution Starts in Japan Today on July 14 with Worldwide Distribution Planned for This Summer! – Smartphone Game Based on “NARUTO SHIPPUDEN”~The first smartphone game based on the popular console game software “NARUTO: Ultimate Ninja” series. GREE, Inc. (Headquarters: Minato-ku, Tokyo; Chairman & CEO: Yoshikazu Tanaka) and BANDAI NAMCO Entertainment Inc. (Headquarters: Minato-ku, Tokyo; President & CEO: Satoshi Oshita) have begun distribution of the smartphone game “NARUTO SHIPPUDEN: Ultimate Ninja Blazing” based on “NARUTO SHIPPUDEN” today on July 14 in Japan. It is available on the App Store and Google PlayTM. Its worldwide distribution is scheduled for this summer. GREE, Inc. is in charge of distribution in Japan and BANDAI NAMCO Entertainment Inc. is in charge of content planning/development/management and overseas distribution. The first smartphone game based on the “NARUTO: Ultimate Ninja” series, the popular console game software! This is the first smartphone game based on the popular console game “NARUTO: Ultimate Ninja” series, the cumulative shipment of which has exceeded 15 million copies. Starting with distribution in Japan on July 14, its worldwide distribution is scheduled for this summer. The worldwide release intends to spread the fun of playing “NARUTO SHIPPUDEN” all over the world. This application offers a new smartphone gaming experience, while also inserting familiar cut-ins from the “NARUTO: Ultimate Ninja” console game series during battles. Players can connect online and enjoy cooperative battles against enemies. By forming a team of up to 3 players, players can enjoy battles requiring a strategic use of positioning. Distributors Japan: GREE, Inc. Overseas: BANDAI NAMCO Entertainment Inc. Copyright　Information ©2002 MASASHI KISHIMOTO/2007 SHIPPUDEN NARUTO artwork and elements ©2002 MASASHI KISHIMOTO/2007 SHIPPUDEN All Rights Reserved. ©GREE, Inc. ©BANDAI NAMCO Entertainment Inc.
* All other company and product names used herein are trademarks or registered trademarks of their respective owners. * The information in this press release is the latest information available at the time of release. Please note that the contents may change without prior notice. * Please use a © drawn in a circle for the copyright notification “(C)”. * Apple and the Apple logo are trademarks of Apple Inc., registered in the U.S. and other countries. App Store is a service mark of Apple Inc.
* Google Play is trademark of Google Inc.
* Separate data fees may apply when using this application. – Promoting Adoption of Communication Functions for Coin Battery Drive Devices. Toshiba Corporation’s (TOKYO: 6502) Storage & Electronic Devices Solutions Company today announced the launch of three new ICs “TC35678FSG”, “TC35678FXG” and “TC35679FSG” as additions to its line-up of ICs that support Bluetooth® Low Energy (LE) ver.4.1 communications. At 3V supply voltage, the new ICs consume just under half the power of Toshiba’s previous products, and realize current consumption on par with the lowest in the industry. Sample shipments start today, with mass production scheduled to start by the end of 2016 for “TC35678FXG” and in early 2017 for the other two ICs. Adoption of a highly efficient DC-DC converter introduced in earlier products and an original low-power circuit design secures a nearly 46% current reduction and peak current consumption of 3.6 mA at 3V supply voltage in transmitting mode. Both “TC35678FXG” and “TC35678FSG” incorporate built-in Flash ROM to store user programs and various data in stand-alone operations. Although memory capacity for user programs was only 64 KB in previous products, it is now extended to 100 KB in both ICs, contributing to the expandability of application programs. The built-in Flash ROM eliminates any need for external EEPROM, previously required for stand-alone operations. This contributes to cost and mounting-area reduction by reducing external parts count. “TC35678FXG” is a repackaged “TC35678FSG” in a QFN60 package that extends the number of general purpose IO from 16 to 32. It is suitable for equipment that requires a large number of control pins such as keyboards and remote-controllers. “TC35679FSG” has no built-in Flash ROM and can achieve extremely low current operation by reducing current consumption for access to Flash ROM. It accordingly achieves long operating times for applications powered by small coin batteries. For example, using a CR2032 type coin battery, the new IC can carry out beacon operation for over a year. The new ICs will facilitate adoption of Bluetooth® LE communications for wearable devices for healthcare applications and for high grade small devices that use coin batteries such as sensors and toys, and will support set makers in optimizing product value. Bluetooth® Smart devices, such as wearable devices, healthcare devices, smart phone accessories, remote controllers and toys. : Low-power-consumption communication technology defined in Bluetooth® ver. 4.1.
: Compared to Toshiba’s “TC35667FTG”. : Products with the same ratings (current consumption of 3.6 milliamps (mA) at 3V in transmitting mode with 0dBm) are the lowest in the industry as of July 14, 2016, Toshiba survey. : Calculated with a 220mAh battery and 2-second beacon interval time. : Devices that adopt Bluetooth core specification ver.4.1 or higher with low-energy core configuration, and that use GATT-based architecture specified in Bluetooth ver.4.0. * The Bluetooth® word mark and logos are registered trademarks owned by the Bluetooth SIG, Inc. and any use of such marks by Toshiba is under license. Other trademarks and trade names are those of their respective owners. * ARM and Cortex are registered trademarks of ARM Limited (or its subsidiaries) in the EU and/or elsewhere. SHANGHAI, CHINA – Media OutReach – Jul 4, 2016 – Shanghai-based fashion designer Grace Chen — whose haute couture styles are favoured by an A-List celebrity clientele, including Oprah Winfrey, Helen Mirren and China's First Lady Peng Liyuan — celebrated her London debut with a star-studded fashion show and gala reception at the palatial Lancaster House on 11 June 2016. Upon royal invitation, Grace Chen presented her new season collection as part of the 90th birthday celebrations for Her Majesty Queen Elizabeth II. 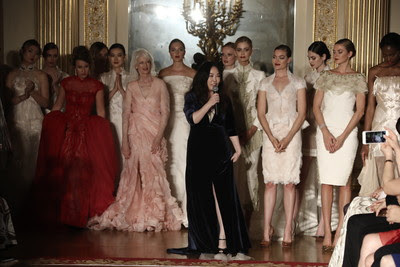 The fashion show celebrated a number of world firsts: It was the first time an haute couture collection from Asia has been showcased as part of British royal celebrations. 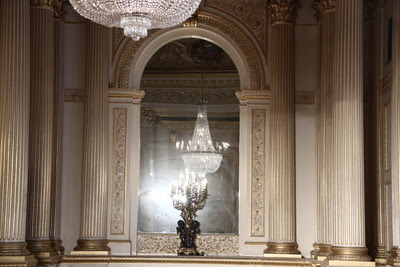 It was also the first fashion show ever presented at Lancaster House, which is rarely open to the public, and was once part of the royal palace grounds. The show, titled Simply Divine, was styled as an homage to the Queen and the British royal court. A curated collection of 50 dresses sashayed down the runway, modelled by both professional models and aristocratic beauties of all ages. The show opened with Lady Ella Mountbatten making her runway debut in an embroidered China-red dress. The gown's extravagant silhouette set a regal tone, while Grace Chen's signature exquisite draping added a feminine softness. 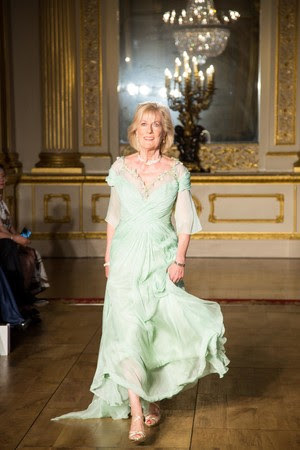 Closing the show was Princess Olga Romanoff, descendant of the Russian Tsars, wearing an ethereal soft-green gown custom created for her by Grace Chen. Grace Chen's designs seamlessly marry time-honoured traditions of Chinese tailoring and embroidery with whimsical global detailing to create one-of-a-kind dresses that are elegant, sophisticated and personal. Among the regal designs showcased, one couture gown featured a Chinese high collar and flowing Waltz skirt. Other gowns were handcrafted in luxurious silk with fine eastern embroidery. The models' hair and make-up was elegant and understated to match the elite, modern style. "Every woman can feel like a queen and enjoy a 'regal moment' when they respect and indulge themselves in beauty," said designer Grace Chen. Reflecting the powerful and sophisticated women that she designs for, many notable British and Chinese celebrities and VIPs attended the show. Immediately following the Grace Chen fashion show and reception, Lancaster House hosted the 21st Russian Summer Ball, an important fixture on the London social scene since 1996, with guests of honour including members of the famous Romanoff dynasty (the Imperial Russian Royal Family) plus European royal families and world-famous celebrities. "The Power Dresser …who China's top achieving women turn to"
Regarded as one of the most influential couture designers in China, Grace Chen was hailed by South China Morning Post in 2015 as "the power dresser…who China's top achieving women turn to". Chen graduated from the Fashion Institute of Technology in New York City and worked as a fashion designer in New York City and Los Angeles for 15 years. She returned to Shanghai in 2009 and established her own couture brand, Grace Chen, attracting an elite fashion following with her unique style of Oriental beauty. Appealing to style-setters in China and around the world who are now looking beyond established luxury labels to more unique and self-defining designs, Grace Chen's exclusive made-to-order designs range from elegant evening gowns and cocktail dresses, to chic day and business wear. The brand celebrated the opening of its first boutique, Grace Chen's Garden, in May 2016. Located in Shanghai's former French Concession, the boutique is crafted as an international fashion destination integrating a boutique, gallery, library, movie theatre and fashion lounge. As well as showcasing her latest designs and facilitating private fittings, Grace Chen's Garden will host elite fashion, lifestyle and social events. Grace Chen's London fashion show debut in June 2016 follows the brand's recent showcases in Europe, as it continues to attract a global clientele of elite women. 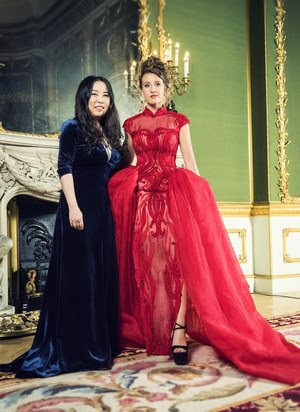 In early 2016, Grace Chen was invited to attend Paris Fashion Week, and she also presented a runway show in Brussels in 2015 as part of celebrations for the 40th anniversary of China-European Union relations. Grace Chen is a Shanghai based Chinese-American fashion designer. Grace graduated from the Fashion Institute of Technology in New York City and worked as a fashion designer in New York City and Los Angeles for 15 years. Her designs were seen on many notable celebrities in the U.S., such as Oprah Winfery and Helen Mirren. Grace returned to Shanghai in 2009 and established her own couture brand, Grace Chen. Her unique style of oriental beauty was soon embraced by the female elites in Shanghai and Beijing. Grace is now regarded as one of the most influential couture designers in China. NTT Communications Corporation (NTT Com), the ICT solutions and international communications business within the NTT (NYSE: NTT) Group, announced today that it has received a network service license from Myanmar’s Ministry of Transport and Communications and has begun offering reliable, high-speed internet connections for enterprises throughout the Yangon area as a first phase, effective immediately. The service, Digi-Path Premier, provides dedicated circuits from 1Mbps to connect enterprises with NTT Com’s global internet network. Optional services include global IP address, web hosting, mail hosting, rental routers, managed firewalls, internet VPN and file transfers. – Highly reliable communication environment. – Digi-Path Premier ensures reliable high-speed communication environments that connect offices with NTT Com’s global internet network via dedicated optical-fiber circuits and a redundant backbone network. – NTT Com fully manages the delivery of circuits from the customer’s office to the global internet network. – Delivery can require as little as one month, compared with six months in conventional cases. Around-the-clock network monitoring. – Digi-Path Premier includes 24/7 monitoring of circuits. In the case of any trouble, the service will minimize the influence on enterprise’s business by promptly fixing the circuit. NTT Com is now providing internet connections to enterprises globally as well as in seven Southeast Asian countries, including Singapore, Malaysia, Indonesia, Thailand, Vietnam and Cambodia, as well as Myanmar. Myanmar has been strengthening its presence in the Mekong regional economy since beginning its transition from military to democratic rule in March 2011. An increasing number of multinational enterprises are entering the market and creating demand for reliable high-quality internet connection services. NTT Communications Yangon was opened in October 2012 to provide ICT solutions that combine global networks, system integration and security throughout Myanmar. The internet connection service, which is now available nationwide, previously had been restricted to tenants in Yangon’s Sakura Tower, a high-rise office building serving multinational companies. NTT Communications (Thailand) Co., Ltd.
GAITHERSBURG, MD–(Marketwired – Jul 12, 2016) – BroadSoft, Inc. (NASDAQ: BSFT) has announced that its annual user conference, BroadSoft Connections 2016, will be held November 13th-16th, 2016 in San Antonio, Texas. The event will welcome hundreds of BroadSoft’s service provider customers, as well as industry leaders and market influencers. At last year’s Connections event, 62% of attendees were senior decision makers within their organizations. Now in its 14th year and once again on track for record attendance, the theme of BroadSoft Connections 2016 is ‘Let’s Change the Game.’ By assembling top innovators and experts, attendees to this year’s event will not only gain valuable knowledge and hands-on experience to use, sell and deploy cloud unified communications, but collectively help shape the future of business communications. "At last year’s event, we unveiled Project Tempo, our vision for the future of work that enables more effective team collaboration by integrating popular enterprise cloud applications with contextual intelligence and real-time unified communications services provided by BroadSoft UC-One®," said Taher Behbehani, chief digital and marketing officer, BroadSoft. "Attendees of Connections 2016 will walk away with invaluable knowledge on how to meet enterprise demand for these innovative communications and collaboration solutions with game changing go-to-market strategies to rapidly grow their market share and unlock new revenue streams." In addition to informative and real-life best practice keynote addresses from BroadSoft executives and industry experts, at Connections 2016, BroadSoft will inspire smarter working with provocative insights from thought leaders on market trends, go-to-market strategies and best practices for obtaining stronger business results in terms of time-to-market, wins, market share, revenue and margins. There will be extensive opportunities to connect one-on-one with peers from around the world, and collaborate on ways to expand UCaaS market share, as well as gaining a competitive advantage through differentiated market offers with live demonstrations of BroadSoft’s full solutions stack that includes PBX, UC, team collaboration and contact center offerings. – New Location Represents Additional Investment by Selling Simplified Group to Capitalize on Growing Opportunity in Marketing Data Quality Segment. With its charter and focus of improving marketing data quality for today’s sales and marketing teams, Acquiro, a marketing technology solutions vendor launched earlier this year, announced today the opening of its Singapore office. Acquiro – part of the Selling Simplified Group (SSG) – was formed with the mission of bringing to market data quality solutions engineered to dramatically increase a company’s revenue by validating and enriching lead contact data. This global expansion by SSG is in response to the increasing need for more complete and accurate marketing data required by companies across the Asia-Pacific Region. Although SSG has an established presence and regional sales team in support of its Selling Simplified content syndication business, the addition of the recently launched Acquiro brand is in recognition of the expanded opportunity for its Software-as-a-Service (SaaS) data solutions product, LeadFUSION. Launched in May of 2016, Acquiro is part of the Selling Simplified Group (SSG) founded in 2012, an organization of sales and marketing technologists who are dedicated to helping companies fill sales funnels and grow revenue – fast! Our mission is to simplify selling so sales teams can focus on closing and growing revenue by keeping pipelines full of high quality, nurtured, sales-ready leads. In keeping with this mission, Acquiro was formed to focus on the development of cutting-edge technologies to bring to market advanced SaaS solutions engineered to improve sales data quality that can dramatically increase clients’ revenue streams. With headquarters in Greenwood Village, Colorado, Acquiro is a global organization with regional offices in California, London, Singapore, and Pune, India. – For 1.5A large current control and 110 degrees Celsius operation. Toshiba Corporation’s (TOKYO:6502) Storage & Electronic Devices Solutions Company today announced the launch of photorelays in the industry’s smallest package. Shipments start from today. The new product, "TLP3406S", utilizes the industry’s smallest package for photorelays, the Toshiba-developed S-VSON4 package. Compared to Toshiba’s previous products in a VSON4 package, the new photorelay has an approximately 22.5% smaller assembly area, which can contribute to the development of smaller test boards and also make it possible to increase the number of photorelays on a board to increase density. Since the new photorelay can drive large currents of up to 1.5A, in spite of its small package, it can be used in device power supplies (DPS) that make up the power supply circuits in various testers. As a further positive, the operating temperature range has been enhanced from 85 degrees Celsius (max.) to 110 degrees Celsius (max.). For photorelay products, as of July 11, 2016. Toshiba survey.